A couple weekends ago I saw Guardians of the Galaxy with the hubs. He wanted to see it from the moment he saw the first trailer. I love comic book movies, so I was down, even though I didn't think it was going to be awesome. Well, I did quite enjoy it and thought it was a good mixture of fun and sport. To me, there are other Marvel movies that are better, but this is still worth the watch. The soundtrack is boss (yes to "Cherry Bomb" by The Runaways!). If you're not familiar with the comic, Guardians is about a group of misfits who come together to defend the galaxy from an evil-doer named Ronan the Accuser. 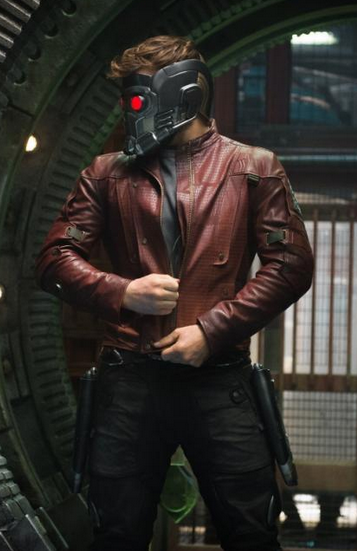 The group is made up of Peter Quill/Star Lord (Chris Pratt)--a thief; Gamora (Zoe Saldana)--a bad guy turned good guy; Drax (Dave Bautista)--a guy looking for revenge; Rocket (Bradley Cooper)--a miscreant who loves explosives; and Groot (Vin Diesel)--a walking tree with limited vocabulary, super strength and a heart of gold. The story line isn't anything unique, but it does tie this film to the other Marvel movies. What makes Guardians so enjoyable is that the action scenes are done well and it has a lot of funny moments too. But I wouldn't call it amazing. Although Bradley Cooper's "Rocket" character is pretty worth it. He is definitely the glue. And kudos to Chris Pratt as well--he's been eating his spinach! My main gripe is that I think they could have done a better job delving into the back stories for the characters. They don't tell you anything deep or too specific about the main group or the villains, so there's a part of you that doesn't care as much as you should. But I'm about 100% certain there'll be a sequel. So we'll just have to wait and see.